A large portion of my heritage comes from the UK. Shoot, my mom’s maiden name – Kelly – is about as Irish as you can get. But I know there’s some English and Scottish blood in there too… Which must be why I absolutely love scones. Love them! While scones may have come from some far-flung country across the globe, most people attribute their origins to just across the pond. Ergo, my love for them must literally be in my blood somewhere. 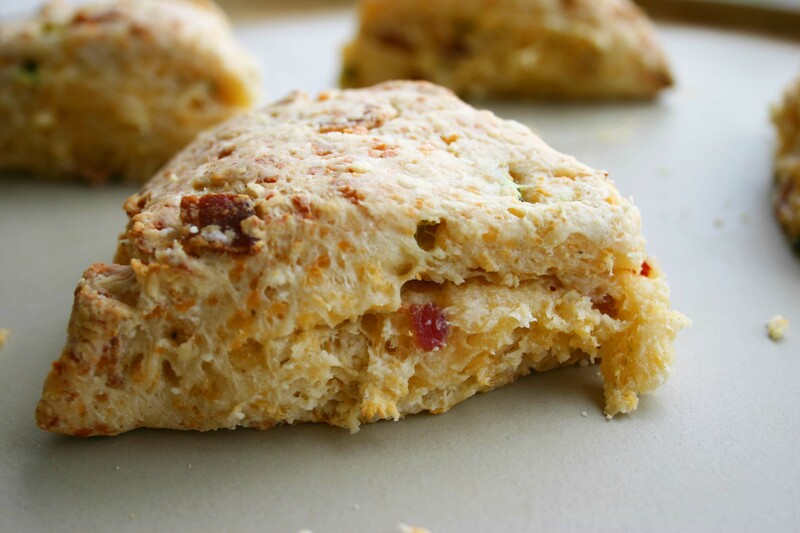 I have soooo many recipes and have made probably a gazillion different varieties of scones, but here’s one I recently made that’s a different twist on the usual fare. Not sweet, but savory. I’ve tweaked it a bit to adapt to my family’s tastes, but you could pretty much throw the whole cheese or deli drawer in these if you wanted. Feel free to experiment and let me know what you think! Stir together the dry ingredients. Gently work in butter with a fork until the mixture resembles cornmeal. Stir in cheese, combining well. Mix in the onion, pepper, and bacon or sausage until evenly distributed throughout the mixture. Add in 1/3 C of buttermilk to hold dough together. Continue to add in remaining buttermilk until dough is easy to handle and can be formed into a ball. On a lightly floured surface, roll dough out into a disk about 8” wide, and approximately ½” thick. Cut into 8 wedges. Bake at 350ºF on ungreased surface (I love my pizza stone for this!) for about 20 minutes or until golden brown. Serve warm. *We have one child who doesn’t like spicy food. 1 T of jalapenos is all he can handle, but feel free to add more if you like!